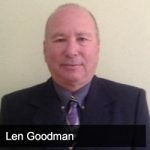 Jason Hartman talks with Len Goodman, certified fraud examiner and author of The Meltdown Chronicles, about the crossroads human beings find themselves. We all feel the footsteps of AI coming and technology is creating an uncertain time, Jason and Len look at what they expect in the transition. Then the two switch topics and discuss what a fraud examiner is and how to avoid scams. [7:15] Why aren’t Hollywood and the music industry held accountable for the content they’re creating advocating violence? [12:31] What is a CFE?